Family House Key West Nightly Rental Home in Old Town Key West. This 2 BR / 1.5 bath Cigar Maker`s Cottage is 1/2 block off Duval St. The home has been renovated and has two stories, private deck, and 8 person hot tub. 18/24: Shared Heated Family pool where we have Happy Hour 4-5 on Wed. and Sat. FAMILY HOUSE, a two-story 1880's Cigar Maker’s Cottage has been completely renovated. The living room has a 50" Smart TV, Bose blue tooth speaker, Amazon Alexa TV/DVD. The walls are adorned with original Robin Hix art. The custom Q sleeper sofa has a 5" memory foam mattress for superb sleeping comfort for the 5th and 6th guest. The just renovated kitchen has granite counter-tops, stainless steel top and bottom frig, stove, microwave and dishwasher. Also provided are coffee maker, blender and toaster. Bar stools on the other side of the kitchen island is perfect for talking with the chef! The kitchen is equipped with everything necessary to cook a gourmet meal: foil, wrap, Ziploc bags, coffee, sugar, cream, dishwasher soap is included. Downstairs is complete with the dining room that seats 6, another 50" Smart TV, Amazon Alexa and buffet. The bathroom has a tiled shower indoors and also an outside shower, both with Tommy Bahama body gel, shampoo, conditioner and lotion. All towels are provided, as well as pool towels. The loft-style second story in the Cigar Maker's cottage (this is where the tobacco was hung to drying the 1800's) contains two bedrooms, each with a King memory foam mattress, 32" Smart TV's. There is a toilet closet between the 2 bedrooms and a vanity in the master bedroom, conditioner, body lotion, and pool towels. If you have never tried showering outdoors in the tropics, this is a must do! The rear private deck has table/chairs, 8-person spa in a tropical garden setting. There are 2 shared heated pools (Family and Adult's Only), 2 shared W/D's for your use after 5p or before 9a. Complimentary Happy Hour from 4-5p on Wed. and Sat. around the Family pool. Daily housekeeping is provided, too! The Family House is a unique gem hidden in a quiet oasis—perfect for the family looking for an upscale vacation with all the features of your own home! Come visit us! Parking in Key West is very limited. This property has no assigned parking but we will have a spot reserved for you upon your arrival. 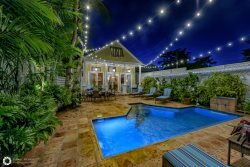 Please contact Key West Hideaways regarding minimum stays and special rates. Minimum stay requirements apply on weekends (at least 3 nights), Winter/Spring season, holidays, and special events (Fantasy Fest & Christmas/New Year are 7 night minimum). Parking: No dedicated parking space; on-street parking only but a spot will be reserved for your arrival. Pets: Pets welcome with a fee; some restrictions may apply. Location: Half-block off Duval Street in Old Town Key West.